With our spectacular mountain ranges, hundreds of glacial lakes and diverse communities, Franklin County draws outdoor adventurers, wildlife watchers, foliage lovers and history buffs alike. We offer unparalleled recreational opportunities with our many mountains, lakes, streams, and ponds, one of the top ten golf courses in the U.S, world-class skiing opportunities, as well as hunting, hiking, biking, swimming, boating, fishing, ATV and snowmobile trails. Farmington, which is the largest town in the county, is host to the University of Maine at Farmington. Named ‘One of Americas Best Colleges’ by U.S. News & World Report for 15 consecutive years, this progressive campus brings students and community together like no other in Maine. Farmington’s Historic Downtown region is one of the most active downtowns in Maine and offers diverse family-owned shops and boutiques with exceptional service. Just outside of Farmington’s downtown region there are endless outdoor recreational activities, including Farmington’s own Titcomb Mountain, where skiing is an option even at night! Franklin County’s second largest town, Wilton, is home to Mt. Blue State Park and the breathtaking beauty of Wilson Lake. In the summer months, take a hike on the many maintained trails, or enjoy the sunset from a canoe on the lake. In the winter, be sure to don your cross-country skis or snowshoes to witness some of the most beautiful winter scenery Franklin County has to offer. Sugarloaf Mountain, located in Carrabassett Valley, presents year round activities for the family or individual adventurer. Whether it be skiing the slopes, shooting a round of golf, or riding the zip line, a great time is guaranteed. A brief trip up north, between Eustis and Kingfield, the beautiful Carrabassett River winds its way through the towering mountains. Grab a pole and fish for salmon and brook trout in Flagstaff Lake. Go snowmobiling in Eustis on the extensive Black Fly Loop. Hike the majestic Bigelow Range. 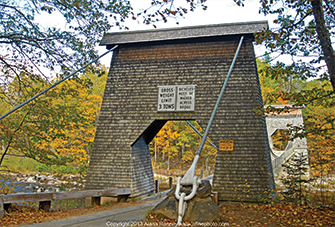 In the fall, the vistas are stunning along the region's many scenic byways. The county offers many choices of places to stay, eat and shop. In almost every town in Franklin County, farmer’s markets provide local meat and produce. The small businesses you visit while touring our quaint villages and downtown main streets are run by local people who will come to know you by name. We pride ourselves on maintaining the small town feel and close-knit community ties that are often lost in other areas and remembered in years past. Just one visit and you will realize that Franklin County is more than just a destination; it’s a way of life.